Our Custom Peptide Synthesis laboratory can produce and purify synthetic peptides in either R&D or GMP environments, and aseptically fill the peptides in our cGMP facility*. Our peptide synthesis service includes the manufacture of normal peptides and custom modified peptides up to 12-15 amino acids in length to suit your requirements. Solid phase peptide synthesis or solution phase chemistry can be used to manufacture your custom peptides. Pre- or post-synthesis operations can incorporate natural amino acids, modified amino acids, and unnatural amino acids. Post synthesis modifications include biotinylation, peptide conjugation, KLH conjugation, linker attachment, and more. We use preparative HPLC to isolate the desired peptide, and the final compound is analyzed again by reverse phase HPLC to verify purity. Depending on your research needs, Dalton can provide material in a range of peptide purity from 70-98%. Mass spectrometry is used to verify the mass of the peptide. Purification can be rapidly completed with our range of HPLC systems with a 200ml/min flow rate. We have HPLC columns with capacities up to 2.2 liters. We are proud of the knowledge and expertise that enables us to offer custom peptide synthesis services to our clients. Dalton is recognized for high quality and technical service, and we stand by what we produce. 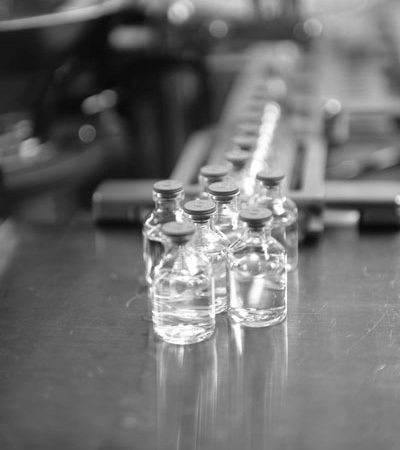 Our peptides are manufactured to the highest quality standards here in our North American facilities. * With our new 18 sq ft lyophilizer, on stream in 2016, we have the capacity for aseptic filling up to 6,750 vials of lyophilized peptide (in 3 ml vials; other vial sizes are available). Learn more about our Pharmaceutical Development & Manufacturing and Custom Synthesis services.